In April 1930, Crimson Tide head coach Wallace Wade shocked Alabama by announcing he was leaving at the end of the next season to take over the job at Duke University. Although the school was deluged with applications for the position, Wade recommended Georgia assistant Frank Thomas as his replacement. A former player under Knute Rockne at Notre Dame, the 31-year-old Thomas had already earned a reputation among his peers as an offensive tactician. After a successful three-year stint as head coach at Chattanooga, he returned to Georgia to serve as backfield coach under his former Irish teammate Henry Mehre. With Alabama president George H. Denny's approval, Wade phoned Thomas an set up a meeting with the younger coach at a track meet at Legion Field. It was pouring down rain when the two talked beneath the stands. Wade told Thomas he was being considered for the job and to expect a call from Denny. After the search committee vetted Thomas' candidacy and a release from his contract with Georgia was obtained a meeting to formally sign the Alabama contract was arranged for July 15 in the Birmingham office of Borden Burr, a former Alabama player who remained involved with the program. Also on hand was Ed Camp, a columnist for the Atlanta Journal who had also recommended Thomas for the job. 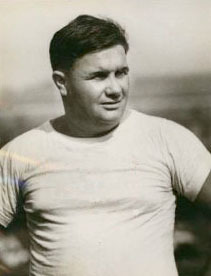 After a short talk, the three-year contract to succeed Wade as the coach of the Alabama football program after the 1930 season was presented and signed. "Mr. Thomas, now that you have accepted our proposition I will give you the benefit of my views based on many years of observation. It is my conviction that material is 90 percent, coaching ability ten percent. I desire further to say that you will be provided with the 90 percent and that you will be held to strict accounting for delivering the remaining ten percent." 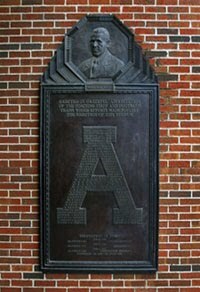 As Thomas and Camp left the office, the new Crimson Tide coach grabbed the newspaperman by the arm and said, "Those were the hardest and coldest words I ever heard. Do you reckon his figures were right?" "I think the proportion was considerably off," Camp replied. "But there is no doubt the good doctor meant what he said."